Jesus did not send himself to Gentiles. Forming theology from his words was never his intent, for the information of the Seminarilly confused. “And, behold, a woman of Canaan came out of the same coasts, and cried unto him, saying, Have mercy on me, O Lord, thou Son of David; my daughter is grievously vexed with a devil. So are we going to begin to listen to Jesus who told us to listen to Paul? “O foolish Galatians, who hath bewitched you, that ye should not obey the truth, before whose eyes Jesus Christ hath been evidently set forth, crucified among you? Or ignoreth Jesus and Paul and continueth in the laweth by whicheth youeth canst in no way pleaseth the Lord by producing fruit of the Spirit. But continuing in the law, shows complete ignorance of what the Bible says. Chris Queen 2/16/2019. Please hit the Follow key above and to the right for future updates. Please leave your valued comments in the form below. 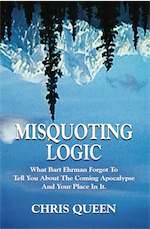 My books Misquoting Logic and Misquoting Calculus by Chris Queen (BSME) are available on Amazon etc.